Some days you eat the bear and some days the bear eats you. 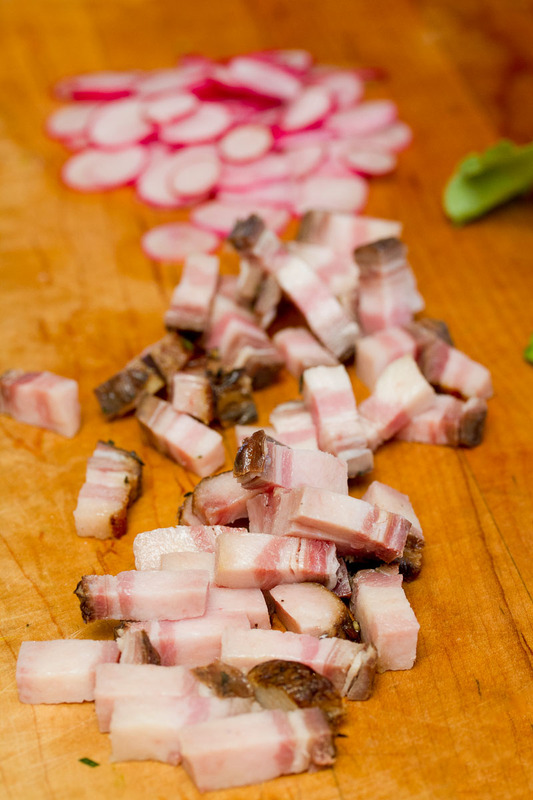 That’s the way it was with Warm Radish Salad with Bacon and Pea Tips. On Day 1 the bear ate me. Salad is a killer to photograph. Light glints off the dressed surfaces, producing bits of glare or “hot spots.” And if the salad is one part greens and another part something else, then while it may taste delicious to toss everything together, that homestyle approach doesn’t make for an alluring photo. The heavier components tend to weigh down the more delicate ones. What’s a guy with a camera and a chef for a wife to do? Make the damn salad and photograph it a second time, that’s what. 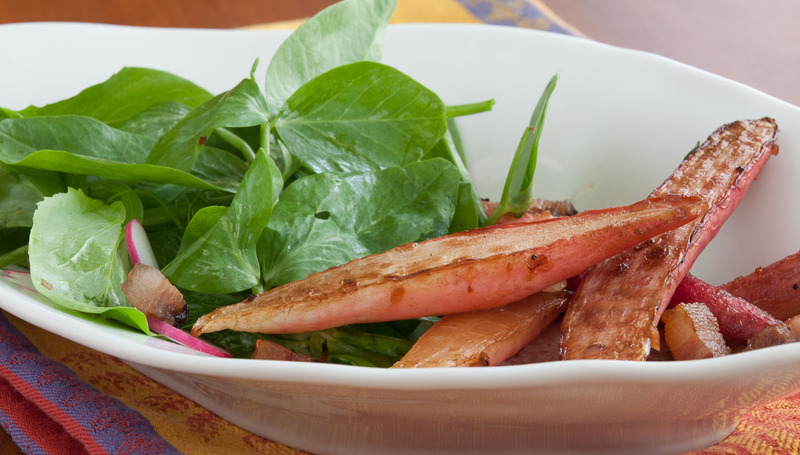 * The salad above is composed with a photograph, or dinner guests, in mind–radishes here, salad there, easy on the dressing. The photo shot from straight down later in the post is the way we’d normally eat the salad in all its messy collapsed glory. Different stees. 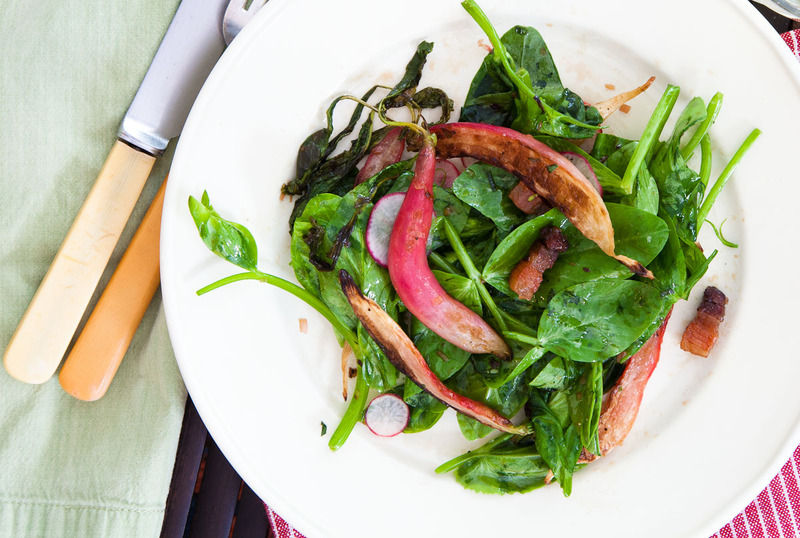 In making the dish twice we also discovered that sautéing the radishes with their greens attached is not a good idea. By the time the radishes are done the greens are toast. You’ll note that the radishes in the sauté pan start out with greens, but the greens have mysteriously disappeared by the last sauté photo. Day 1, Day 2. Nothing against radish greens. We just don’t like them charred. The Asian-American woman in our local farmers’ market sternly warned me against wasting the greens. “They’re good for blood pressure!” To include the greens, wait until you’ve returned the bacon to the pan before tossing them in. They’ll wilt in a minute. Your heart will thank you. But I’m not sure you’ll want to photograph it. *For the record, Jody made the salad on both days. Wash the radishes and remove the greens. Discard the greens or, if they’re in good shape, set them aside to add them in Step 4. Slice 2 radishes into rounds as thin as possible. Cut the remaining radishes in half lengthwise. Trim the stringy swirly tendrils at the end of the pea tips and discard. Remove any tough leaves at the base of the stems and discard. 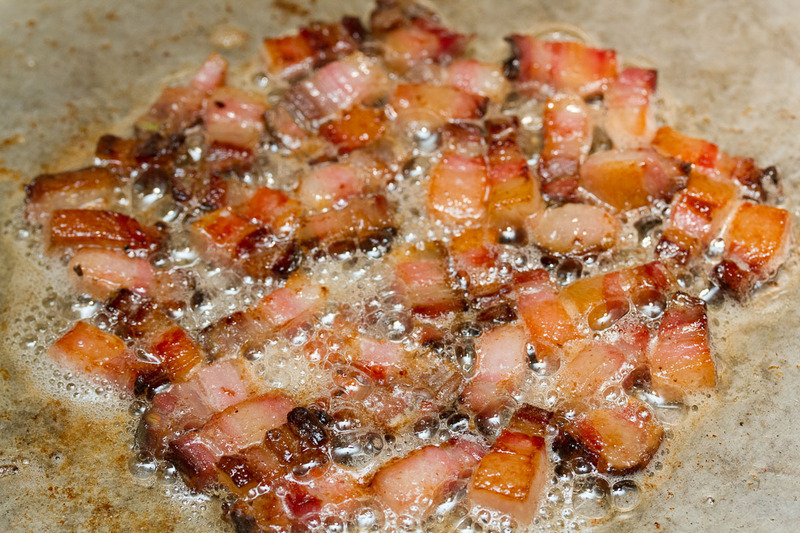 In a large sauté pan over medium heat, cook the bacon lardons until rendered and lightly browned, about 5 minutes. Transfer the lardons to a plate lined with paper towels. 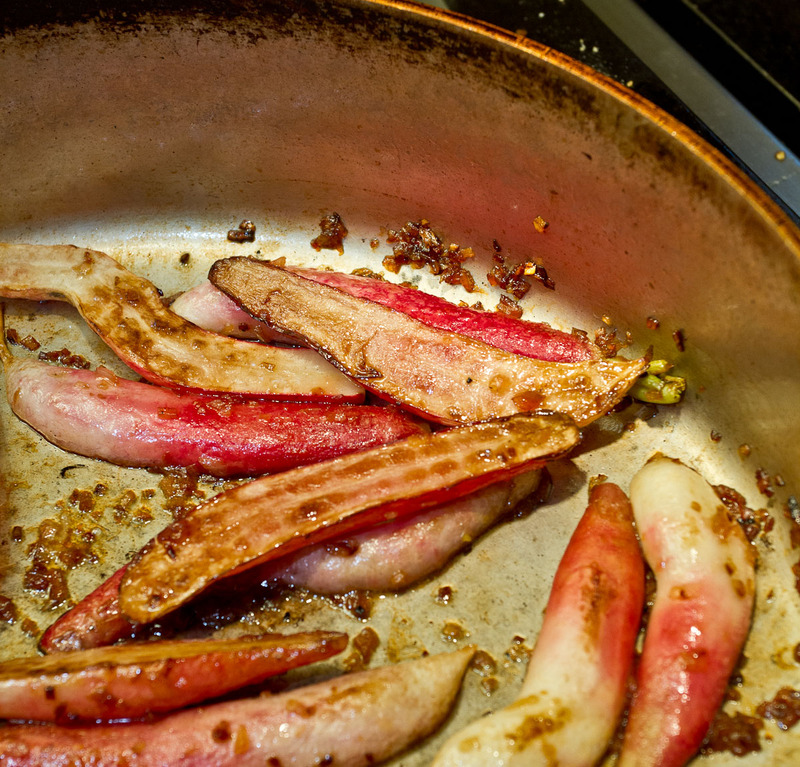 Add the radishes to the pan, cut side down, cover and cook 3 minutes or until lightly browned. Season with salt and pepper, turn and cook on the second side 2 minutes. Add the shallots, toss well and cook 30 seconds. Add the radish greens, if using, stirring them about until they wilt, about a minute. Add 2 tablespoons water to slow down the cooking. Then immediately add 2 tablespoons vinegar and all the honey. Toss well. Remove from the heat. 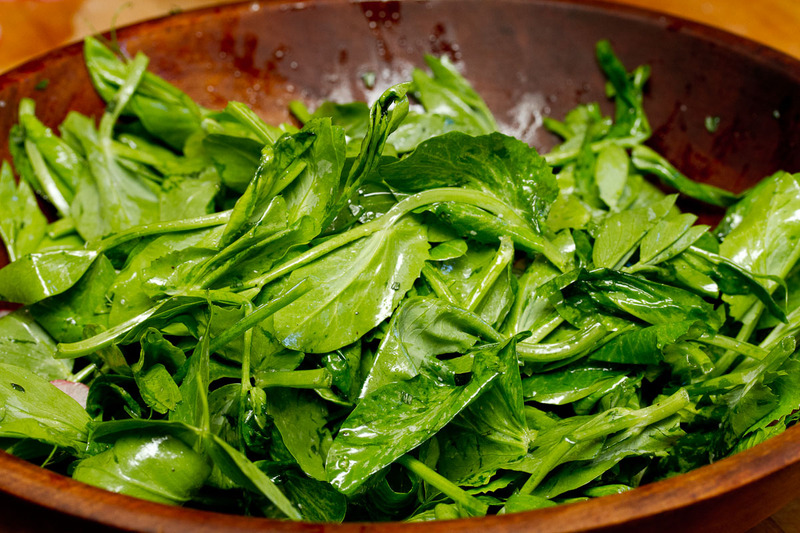 In a salad bowl, combine the tarragon or basil and pea tips. Season with salt and pepper, add the remaining vinegar and the olive oil and toss well. At this point you can either go homestyle and toss everything together (what we do), or for a less messy look, plate servings individually, first with some of the salad, then the radishes next to them. In either case, serve at once. Radishes and celery rarely make it onto the stove. 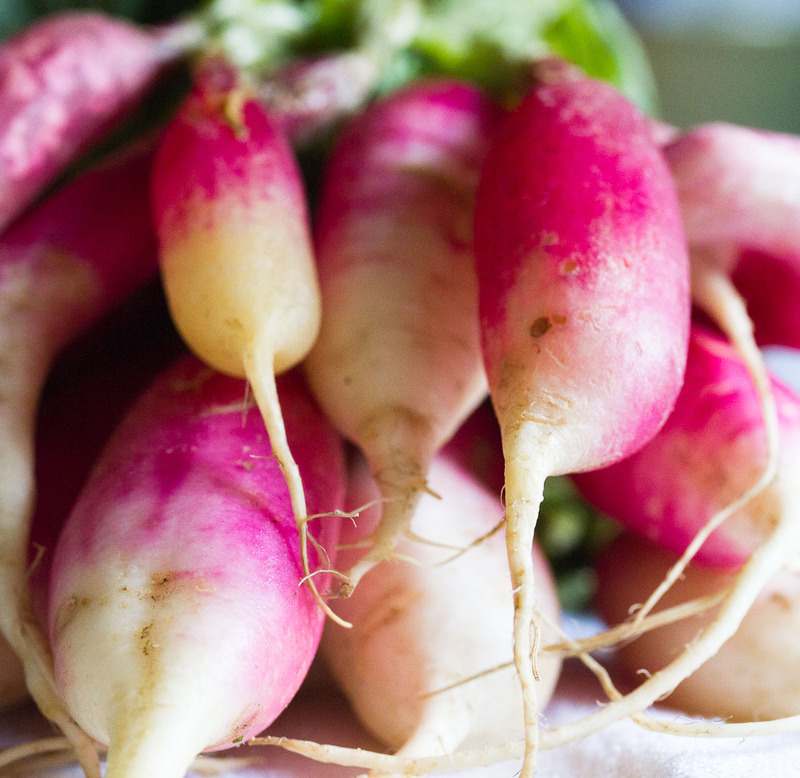 In my family, radishes were always eaten raw, usually part of a crudites platters. Celery was a little more versatile and made its way raw into tuna fish salad and cooked into ratatouille. I learned about braising radishes in butter from the French, and to grill celery from Italians. Now there’s no stopping me–I’ll try any new approach at least once. A Moroccan man who worked in my kitchen taught me a new way to cook favas, which I’d previously been shelling, then laboriously peeling. Now I cook them not only in their skins, but in the whole pod–they’re delicious! 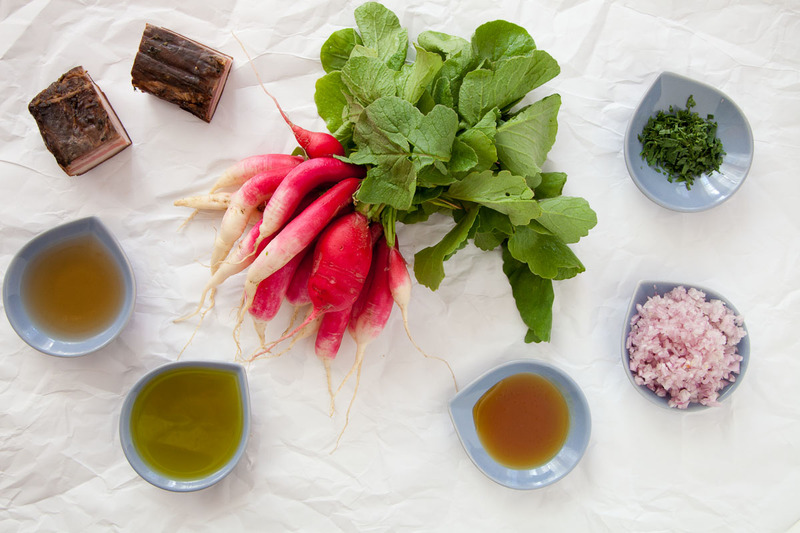 Being open to new ways of looking at vegetables can also take you in the opposite direction–from cooked to raw. Who knew I would ever advocate eating thinly sliced beets raw? Or asparagus, for that matter? Right now I draw the line at eating potatoes raw, but someday, who knows? 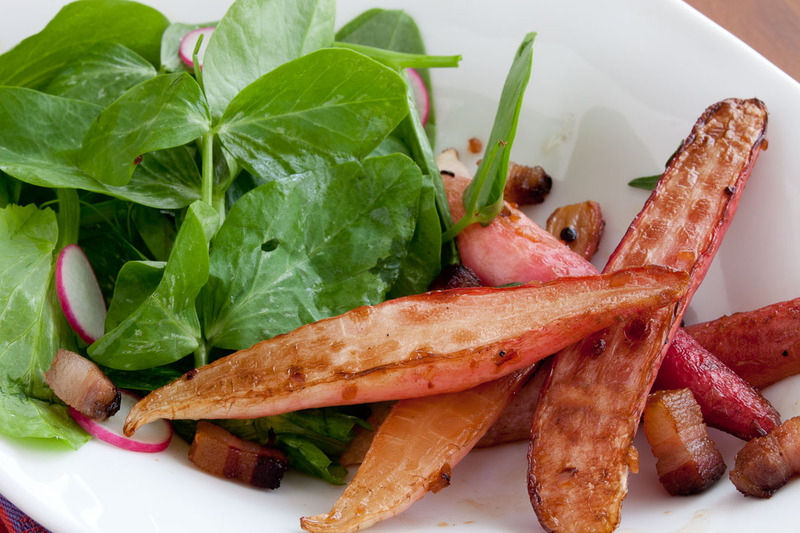 This entry was posted in Easy, Lunch, Salad, Side dish, Uncategorized and tagged bacon, basil, Breakfast radishes, champagne vinegar, lardons, pea tips, photography, radish greens, radish tops, radishes, tarragon. Bookmark the permalink. 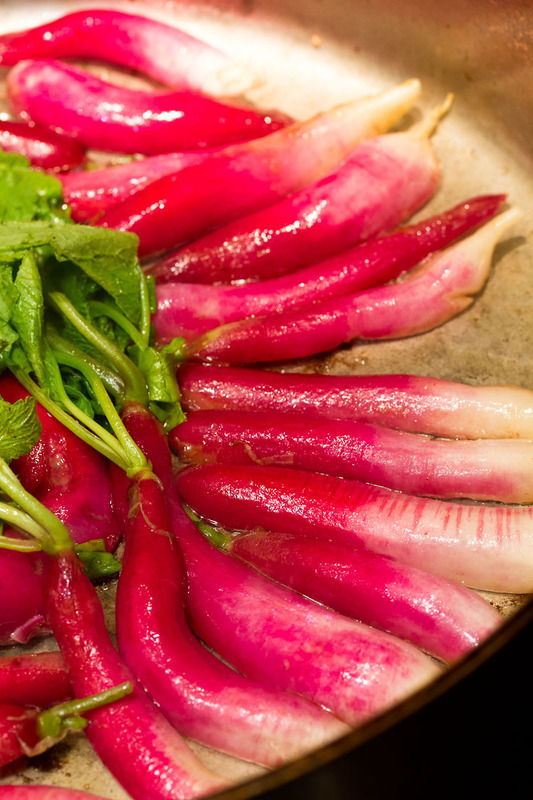 I’ve never thought these shiny red radishes can go onto the stove! I usually eat it as a salad or make kimchi ;-) … They look so beautiful with bacon and peas. Good to know! Thank you! I didn’t see the first set of pictures but this looks delicious. I felt a bit guilty reading this: I always mean to use the attached greens on radishes and such but usually by the time I get around to them they aren’t looking all that appetizing. I love radishes, French-style with bread and butter and salt, but as my father in law pointed out, the radishes are just a cover for an excuse to eat butter and salt. 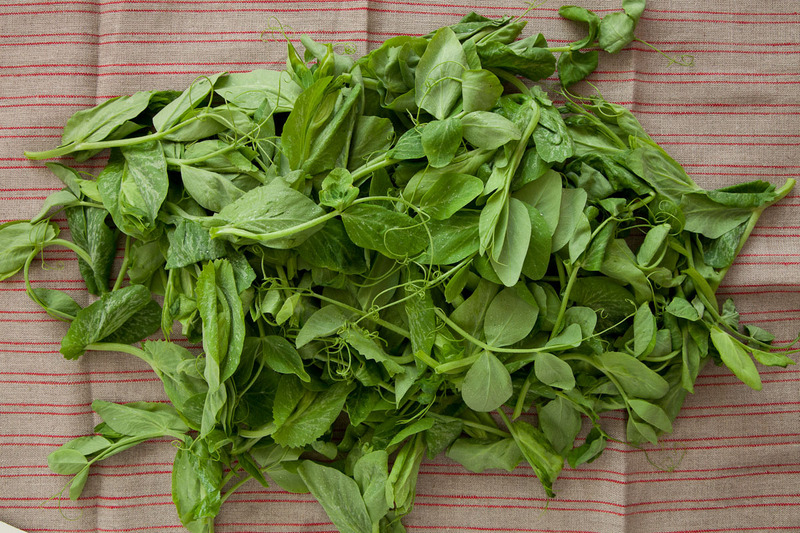 One question though – what are pea tips? Are they the same as pea tendrils or pea shoots, or something different?